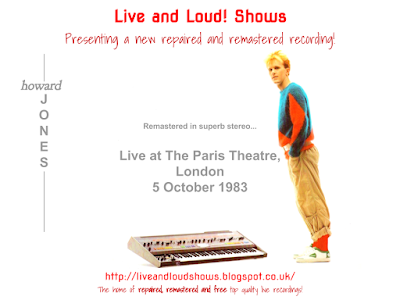 Some time back I was asked if I could find an early Howard Jones recording - it took a while but I finally found some and this was the earliest. Someone had already worked on this and to be honest it sounded pretty bad - far too loud, noise pushed up too and the sound balance was lopsided! So I spent some time fixing the sound balance, removing some noise and then EQing to remove the worst of the OTT bass that had been added and tidy up the rest. Interesting to hear Howard introduce What Is Love? as just "Love" first of all, before correcting himself - that was its original title (you can hear a very early version of the song if you read on to the bottom of the page!). Anyway, the gig does sound nice and clear now, just a shame its a little short! The show is available to download here as 1 MP3 file. Or, if you would like to have separate tagged MP3s, or even lossless files in FLAC format, head on over to the Donations tab to see how you can obtain these for a very small donation towards the site costs. I came across what was labeled as some early Howard Jones demos, including a very early version of What is Love? The file says 1977 - can't tell you whether that's accurate or not - and a couple of people below refuse to believe its even HJ at all - but I thought it would be a nice little extra to throw in as this gig is quite short and you can make your own minds up. Please note, I've not done anything with the sound on these, they are "as is" so a bit noisy and old sounding! You can download the zip file containing 5 tracks here. Thnaks for HOJO but those demos are a joke . Firstly Hojo not even around in 1977. Secondly no way in the world in that Howard Jones. Someone's pulling your leg!! He was active in music for years before that - his own website says so. Others can make their own minds up; I've just said what they're labeled as. What Is Love? was certainly an earlier song called Love originally though and that appears on the demo recordings. Thanks for listening. I've updated the page to clarify my position on these - no doubt there are others with far more knowledge of his work than me. At any rate people can make their own minds up. Yes he is - I got to see his piano only show last year. Thanks for listening!